Louis McDonald rests his hand on the Medicine Tree during the Salish Tribe's annual trip on September 28, 2017. The Medicine Tree is located off the Flathead Reservation in the Salish's aboriginal homeland. The tree is part of the Salish's creation story and every year members of the tribe return to it to pray. Xasxs, a root used for medicinal purposes and also in ceremonies, can be chewed on, ground down or used for tea. My dad and my nephew, Andrew, 7, dig for bitterroot during the Confederated Salish and Kootenai Tribes' annual gathering on May 9, 2018. The bitterroot was a staple harvest for the Salish people and each year after the bitterroot is dug and peeled, the members return to the Long House to eat the bitterroot and the feast that accompanies it. My nephew plays in a creek near our campsite during the annual Arlee Esyapqeyni. 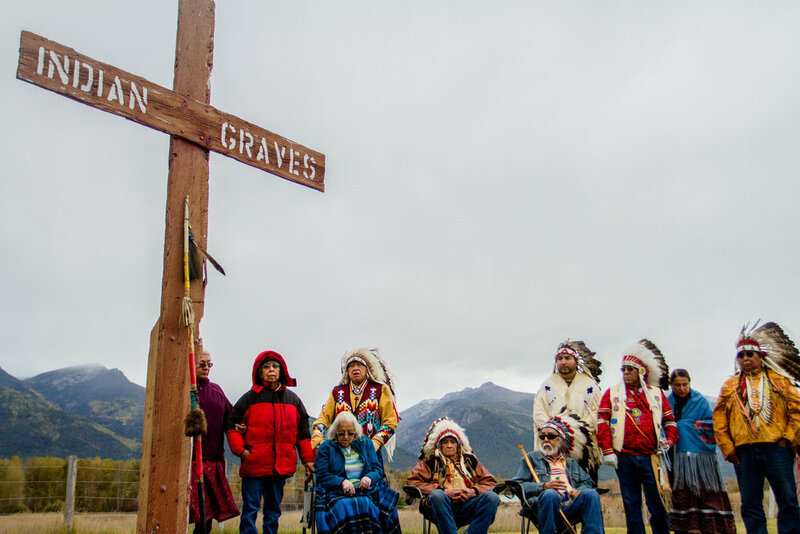 The Salish retrace the 55-mile journey their ancestors took when the Salish were removed from their homeland and forced onto the Flathead Reservation. The final destination was a mass grave for Indians behind a church. This walk was not a celebration but a reminder of what our ancestors went through. A point of reference on how recent the forced removal of the Salish was—There were walkers with parents who were on the original walk. Harriet Mcdougall speaks during the Salish Tribe's annual trip on September 28, 2017. The Medicine Tree is located off the Flathead Reservation in the Salish's aboriginal homeland. The tree is part of the Salish's creation story and every year members of the tribe return to it to pray. Sneaking some otter skin kisses at the annual Headstart Powwow in Ronan, Montana.